Is Your Employer In Trouble? Credit: this post references data that originate with the Western Interstate Commission on Higher Education (WICHE) and the Integrated Postsecondary Education Data System (IPEDS) at the National Center for Education Statistics. The discussion on draw rates derives from the excellent data visualization work of Jon Boeckenstedt at Higher Ed Data Stories (I used data points pulled from his Tableau creation, linked below, which is in turn a product of IPEDS data). In September 2013, I wrote about how colleges and universities in the USA, and the faculty who work in them, need to respond to demographic changes in the market for higher education. In many U.S. states, the number of high school graduates is decreasing; nationally, high school graduates are more culturally diverse, less wealthy, and less academically prepared for college than they used to be. In light of the recently-announced closure of Sweet Briar College, I thought I’d revisit this topic. Although terrible financial decision making likely played a large role in Sweet Briar’s proclaimed demise, the official word so far from the college’s leadership is that it could no longer attract a large and wealthy enough student body. According to Sweet Briar’s president, over forty percent of its students received Pell grants, close to forty percent were first generation college students, and a third were minority students. Students’ increased need for financial aid drove the college’s discount rate to sixty percent. In essence the draw rate measures how effective a college or university is at attracting students. Attempting to maintain enrollment by simply becoming less selective in who gets admitted gets revealed by a lower draw rate. 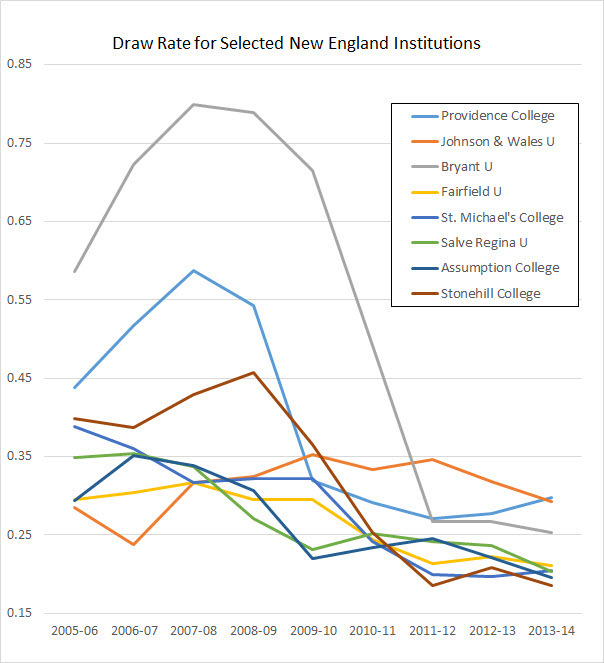 Below are the draw rates of some private, not-for-profit New England colleges and universities. Johnson & Wales and Bryant are secular, the remainder are Catholic-affiliated. Johnson & Wales is by far the largest, with about 9,000 undergraduates. At the opposite end are Assumption, St. Michael’s, and Salve Regina, with full-time undergraduate enrollments of approximately 2,000 students. Stonehill is a bit larger, at 2,500, while Bryant and Fairfield are in the 3,000 to 4,000 student range. We see that these schools’ draw rates peaked just before the beginning of the Great Recession and then plunged thereafter. The plunge coincides with the start of a downturn, which will last at least a decade, in the number of high school graduates in New England. Depending on the state, this downturn is predicted to be from 7 to 19 percent by 2019. The pie of potential students for these schools is getting smaller, and the draw rates tell us that on average they are trying to generate more applications and are admitting more applicants in the hope of maintaining the size of their respective slices. Some of these schools are achieving more success with this strategy than others. But which ones? For the answer, we can compare 2013-14 draw rates to those in 2005-06. Let’s also broaden the sample a bit by using Higher Ed Data Stories to include two other schools in the vicinity, Boston College (Catholic) and Curry College (secular). I have ordered the table below by the percentage change in draw rate. What might explain the variation in the change of draw rates? Does having a campus in or near a major metropolitan area matter? Boston College is, as its name implies, in Boston, Massachusetts, which has a population of 650,000. Johnson & Wales and Providence College are in Providence, Rhode Island, a city less than a third the size of Boston. St. Michael’s abuts Burlington, Vermont, with a population of only 42,000. Fairfield, Connecticut, is not much bigger than Burlington, but it is less than 25 miles from New Haven and Bridgeport and within an hour of New York City. Curry and Stonehill are in even smaller towns, but 10 and 26 miles from the center of Boston, respectively. Assumption College is in Worcester, Massachusetts, which has nearly the same population as Providence. In this sample, we do not see any clear relationship between proximity to a major metropolitan area and changes in the draw rate — though I suspect that, given rising urban migration in the U.S., an urban location will soon be highly advantageous for many schools, if it isn’t already, as Sweet Briar probably demonstrates. Does being a Catholic institution confer an advantage? Boston College’s draw rate dropped by only 10 percent. But the draw rates for Salve Regina, St. Michael’s, and Stonehill decreased from 40 to over 50 percent, and the secular schools rank first, eighth, and last on the list. Religious affiliation does not appear to differentiate a school from its competition in terms of enrollment management success. Size appears to matter. Boston College’s undergraduate enrollment is about the same as Johnson & Wales’s. Going big long before the Great Recession might have better positioned a school for enrollment success afterward. But what’s most interesting about these two schools is their prestige relative to one another and to others in the sample. Boston College is by far the most prestigious of the schools on the list. We know this because its draw rate is, even for the 2013-14 entering class, so much higher than that of any of the other schools. A very large proportion of people who apply and are admitted to Boston College decide to enroll there. Johnson & Wales, on the other hand, is far less prestigious. It ranked last by draw rate for 2005-06. But by 2013-14, its draw rate had actually increased by a few percentage points while the draw rate had crashed for every other school in the sample except Boston College. Johnson & Wales has succeeded where other schools haven’t — even those that, at least in 2005-06, might have had a better reputation than Johnson & Wales did. How is Johnson & Wales holding the line in an increasingly competitive environment? One reason is that it has a clearly-defined brand — hands-on, workplace-relevant learning in a small number of career-oriented fields. The school’s stated mission is to “support its students in fulfilling their professional aspirations.” That’s it. A simple message that is apparently effectively communicated. The school has identified a market niche and has learned how to exploit it. Can you say the same about your employer? Given the title of this post, readers might be wondering why I haven’t talked about endowment growth, debt-to-equity ratios, or other financial performance measures. If you do happen to be interested in these topics, go to the interactive graphic in this report by Bain & Company. I have focused instead on enrollment, because the vast majority of colleges and universities in the USA are, like Sweet Briar College and the institutions discussed above, heavily dependent on tuition revenue. If not enough students enroll or the wrong kinds of students enroll for a long enough period of time, your employer will end up in a very precarious financial position. Enrollment management is thus likely to be job number one on your campus, and you as a faculty member need to be an active participant in it. How are you helping your employer differentiate itself from the competition? How do the academic programs you participate in help build your school’s brand, and is this effectively communicated to potential students? I recently asked a faculty colleague at another university to describe his department’s major with one word. The word he came up with was “useless.” This is not a good sign. If a highly-educated individual with extensive knowledge about a product cannot articulate a single reason why that product might be of value to a potential customer, it’s almost certain that the market is receiving the same message. Thanks for sharing my information; I greatly appreciate it. One little clarification, however: I use draw rates to show the futility of attempting to become selective for the sake of selectivity. That is, colleges have attempted to generate more and more applications so that presumably, their admit rate goes down. But doing so requires your yield rate to go down as well, which allows the draw rate to reveal this. It’s a fool’s game at most places because the incremental applicants are much softer (they have lower affinity, and thus a lower inclination to enroll.) If you knew who these softer apps were, you might be able to pull it off, but it’s impossible to tell with precision. If you get more selective via traditional means (getting better, for instance) and you can admit a smaller percentage while keeping your yield high, it’s a success. I agree (of course, not being an expert myself). I don’t see any of these schools being able to pull off appearing more selective in the near future.